We work with a lot of Ford Motor Company Employees looking to buy or sell their home in Livonia Michigan. Although there really is not an employee special option to purchase real estate like there is when we purchase a car (A-Plan, X-Plan, Etc) there are some important things to consider. If you are a Ford relocation home buyer or seller take note on what incentives you are being offered and what you need to do to get all of them. Also do just a bit of research on what is happening in the location you are looking to buy in such as schools, parks, road traffic, shopping, medical centers and what real estate agent you may choose to work with. We offer all of our potential clients the opportunity to sit down with us and go over what is to come. We will cover title insurance, how tax amounts are calculated, home owners insurance, financing, municipal inspections, private inspections, home owner-ship types (bank owned, short sale, private owned, estate sale, etc) and how all of this pertains to your individual situation. This initial consultation is free of charge and normally last just over an hour. Many of our local Ford Engineers and IT personnel really love this up front meeting. During this time we decide if we are a good fit to work together and go over all of your thoughts and concerns. Livonia Michigan is basically broke down in four school districts. Three of them are run by the Livonia School District and the other is called Clarenceville School District. In a nutshell the three Livonia districts are broke down by which high school your child will attend. The south-east section is Livonia Franklin, south-west is Livonia Churchill, most of the northern part of the city is Livonia Stevenson while the north-eastern tip is Clarenceville school district. Please take a little time and do your home-work as to which area would suit you and your family the best. 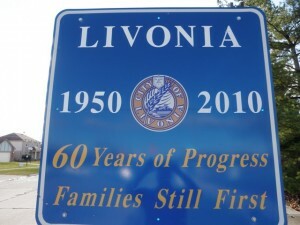 There are some really great things about living in Livonia Michigan and the surrounding area’s. In Livonia there are a few really nice parks (Bicentennial and Rotary just to name a couple), good schools, Laurel Park Shopping Mall, convenient access to downtown Detroit, close to medical facilities, city Library, offers the Livonia Recreation Center and so much more. If you’re looking to purchase a home in the Livonia Michigan area feel free to browse www.BobandTeena.com or www.RealEstateBusyBees.com for loads more information. Feel free to contact us at BobandTeena@Yahoo.com anytime for any real estate related questions or concerns you may have. We look forward to meeting you and assisting you with all of your future real estate needs.